We had as our guest on the radio show R D Dintaman, the representative for Callaway Golf Clubs. Phil Mickelson credits his new Callaway golf clubs and the new Callaway golf ball with his recent success. To hear all about it just go to our radio show page. Phil Mickelson Got Greedy and it Cost Him! Without a doubt the 10th hole at Riviera C. C. is very small and has a significant grade to it. However, with the ability Phil Mickelson has for using that 64 degree wedge of his, I am very surprised to see that he chose to go at the green with a three wood and potentially put himself in a very difficult position to save par, much less make a birdie to win. I would have suggested to him, (if I were his caddy) hit 3 iron off the tee and leave it 50 yards from the green. Yes I heard that none of the other players in the field made birdie from leaving it short. This is sudden death! Phil would have had the opportunity to play first on the second shot and put the pressure on both of the other players. I just can’t picture someone like Hogan or Trevino or Nicklaus going at the green in that situation. Arnie yea! No doubt. Of course the two three putt greens coming in didn’t help either. I do not blame the three putts as much as the choice in club selection that left him so far away from the hole. I’ve had so many emails about the Hogan video that I thought it best to do an analysis with the V1 software to better describe what I’m talking about. The tilt! You’ll see it on the video. The hips turn while the shoulders tilt. They do NOT work together on the same plane. If you turn your shoulders with your hips, you will swing “over the top” and either pull the ball or slice the ball. Also please careful about taking too deep a look at this. You should NOT try to copy Ben Hogan’s swing. Apply the same principals NOT necessarily the same positions. If You Get This You Could Be Breaking 80 Consistently! You might have seen this on Youtube but I’ve had this video well before it ever went on Youtube. This used to be an obscure video of Ben Hogan visiting some friends where he demonstrated his technique for swinging in very slow motion on the beach. Why practice in slow motion? Well I guess you can feel every movement and send signals to the brain telling it where you want to be at every step. The BIG key here is this! Notice during the slow motion portion how much shoulder tilt Ben incorporates and how much he over emphasizes it. He literally backs up during the “under” motion of the shoulders. This is the one BIG key that most golfers do NOT get. The shoulders have to turn parallel to the same plane as the golf club path! See my Blog entry for December 8th for a training video on turning your shoulders through the impact area. Another BIG key! Notice how Ben also performs his waggle in slow motion. The waggle in the old days was a rhythm exercise. 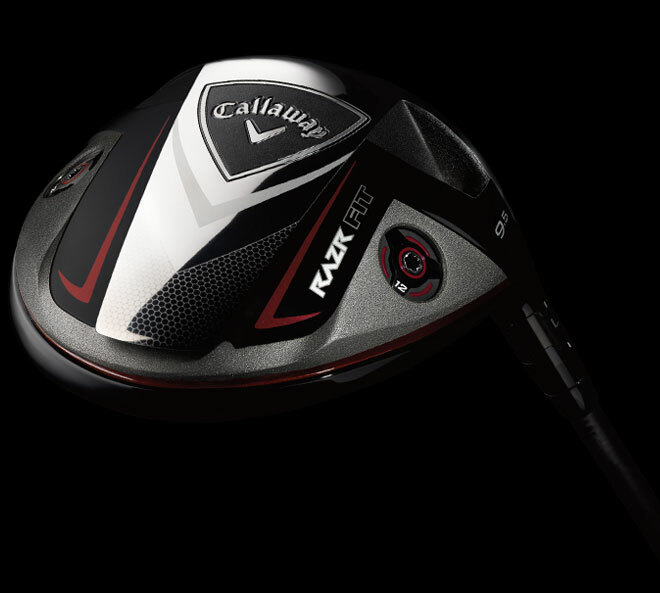 It kept you loose and set the pace for your swing tempo. Today the waggle is a rehearsal for the initial path of the golf club on the take-a-way. The players are more mechanical today and build their swings more for power than accuracy or consistency. Please hang in their until he reaches the portion on the video where he swings in slow motion. It’s worth it. Now hereeeeeeeeee’s Benny! We had a workshop lesson this past Saturday at Patterson and the topic was the impact position. We have some serious weaknesses there. This topic is NOT given enough emphasis. Think about it, if you can’t get to the proper impact position what’s the use working on your swing plane and all kinds of other stuff. 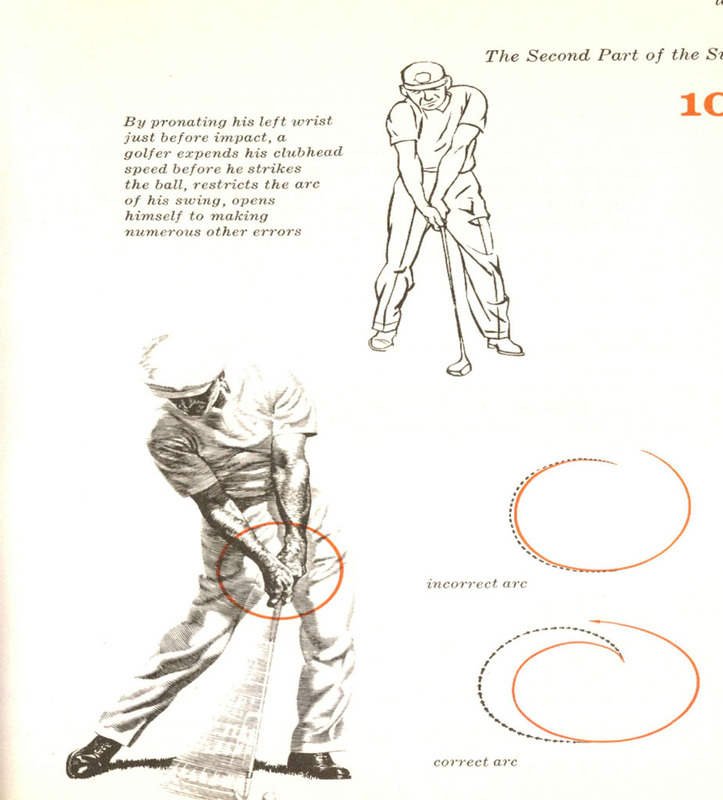 This picture to the left is right out of Ben Hogan’s book which is still very relevant today. I put together a short video to help you better see the difference between scooping which ads loft to the golf club, effects your distance, ball contact on the bottom edge of the golf club and the lack of the good feeling at impact and the bulged wrist effect Hogan talks about. Here’s what Hogan said in his book. He put it in CAPS so I will as well. AT IMPACT THE BACK OF THE LEFT HAND FACES TOWARD YOUR TARGET, THE WRIST BONE IS DEFINITELY RAISED, IT POINTS TO THE TARGET AND AT THE MOMENT THE BALL IS CONTACTED IT IS OUT IN FRONT, NEARER TO THE TARGET THAN ANY PART OF THE HAND. I put together a video to help you with this. I will be filming a drill at Pendleton on Monday if it’s not raining so visit your Member’s Only Section often for new features. Please take a moment to watch the short video I just made on this subject.